Did that confuse you? Or are you now excitedly wondering if there's a third child I'm announcing. Well, no, there will be no third baby. Sorry. But when we go to Toys R Us as a family, it's definitely Mommy and the three kids. I'm pretty sure the thing Adam likes best about having kids is the toys. Ok, before anyone gets all crazy, of COURSE that is not what he likes best. And I have a feeling as the girls get a little more....girly, his love of the toys may diminish somewhat. We'll see. In case you're one of my few readers who lives out of the Northeast, you should know we're supposed to get a pretty major snowstorm tomorrow. I'm pretty relaxed about snowstorms. We live in New England, and it's winter, and it snows. Adam works from home, I stay home with the girls, and we don't need to go out. However, I usually grocery shop on Friday nights. Since that clearly wasn't going to happen, and I definitely needed to hit the store before the weekend, I went today during naptime (a huge perk of Adam working at home). The store was a zoo, so although I'm glad I went before the evening rush, it still took me a while. I mentioned when I got home that when the girls got up, I'd take them out with me because I wanted to see if I could find a sled on clearance. We didn't have one the last time we took the girls outside in the snow, and I'm sure they'll love it. Always good to have some options! Adam immediately told me that he wanted to come. He's been swamped with work lately and I knew he was itching to get out of the house, at least for a little while, even if it was just to Target. As we were driving, he asked if I was planning to go to Target or Toys R Us first (they're in the same plaza). I wasn't sure, and he told me he figured we'd have better luck at Toys R Us. I was fine with that. Well as we loaded up the cart(s) with children, I figured out his ulterior motive. That man LOVES Toys R Us. I always seem to forget that until we're there. When I was pregnant with Madison, and we were on the Babies R Us side of the store all the time, he would always find an excuse to head over to the Matchbox car aisle and pick out a car for himself. In fact, that's the aisle he and Madison ended up in first, while Reagan and I made it to the seasonal area. We were in the store a long time - much longer than I anticipated. Of course, I was also anticipating we'd be buying ONE sled. Well, we did find two sleds for a total of $14 (yay!). We also checked out a gift for Reagan's birthday (which we were spelling until we realized that Reagan still hasn't hit the age where we need to be sneaky). We also almost left with multiple toys, including a new toy golf set. We did end up adding a new game to the cart though. Lately, Madison and Adam have been playing game while I put Reagan to bed, like Candy Land, Memory, and dominoes. 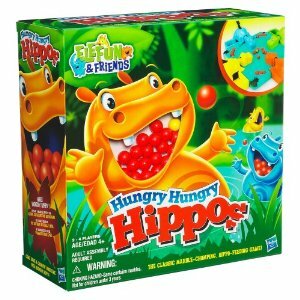 So tonight we added Hungry Hungry Hippos to that stash (which Madison calls Gulpy Gulpy Gators). If you don't understand Madison's name, you clearly don't watch as much Disney Jr. as we do. And I get to play police to keep the 11 month old from eating the marbles. Yes, we're keeping the game in Madison's room. But Reagan is crafty. I'm sure she'll find them. How do I let the three of them talk me into these things?